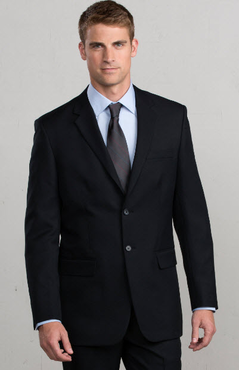 Your staff will love the convenience of a stylish, professional suit coat that is machine washable! Effortless style meets easy-care in this lightweight, machine washable suit coat from Sharper Uniforms! The machine-washable suit jacket is made from a polyester material with a twill weave that offers natural stretch and comfort. Plus, the polyester lining has inner mesh at the shoulder/collar and elbows for quick drying and all-day comfort. Looking for a suit coat that's easy to care for and easy on the eyes? Then look no further - this classically tailored men's suit coat is handsome and machine washable at home. Select this option when you are seeking hotel uniforms. The men's machine washable suit jacket from Shaper Uniforms has a basic two-button front closure and classic tailoring. It includes a welt breast pocket, two side pockets and two inside pockets. The fully-lined design is perfect for all-day wear and the wrinkle-resistant fabric is the ideal choice for the service industry. Set the water temperature to "cold" which is generally between 80 and 60 degrees Fahrenheit (26.7-15 Celsius). Wash on gentle or permanent-press cycle with like colors and similar fabrics (i.e., navy and black with similar dark colors); avoid washing with colors that bleed like reds, purples and oranges. Select a mild detergent (i.e., Woolite) to use in the wash cycle and definitely no bleach, bleach substitute, chlorine or all-fabric bleach. 1. Turn the pant, jacket, vest or skirt inside out so that the seams or lining are on the outside. 10. Remove the pant from the wash cycle and place in the dryer on delicate cycle for 10 minutes and then hang up. Once the garments are hung up, you may want to give them a small tug both horizontally and vertically and then smooth the fabric with your hands to reshape the garment.